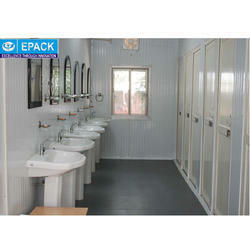 We are one of the leading manufacturer and supplier of Prefabricated Toilets. The offered toilet is manufactured using top notch quality raw materials with the aid of latest techniques under the supervision of our diligent adroit professionals. These toilets are highly recommended by large number of clients for their commercial use. These toilets find application in various industrial sites, hospitals, hotels, restaurants and many other places. 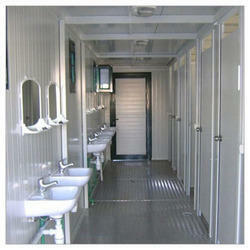 Furthermore, the provided toilets can be easily purchased from us at leading industry rates. Portable toilets offered us uniquely designed and developed keeping in mind the exact demands and requirements of clients. These are made using finest quality raw materials and following international industrial standard. These are straightened with urinals, aluminum chequered flooring, fresh water storage tank / holding tanks, water pumps sewage pumps, hot & cold water tap connection and many others which make these extensively useful. We especially take care for the proper ventilation of these portable toilets. We also provide these in customized sizes and designs in accordance with the precise demands of clients. We are a well-renowned organization engaged in offering a superior quality assortment of Modular Toilet.The offered toilet is manufactured using top-notch quality raw materials with the aid of latest techniques under the supervision of our diligent adroit professionals. The offered toilet is equipped with all basic amenities and finds application in business and commercial sites. Moreover, clients can avail this toilet at reasonable prices from us. 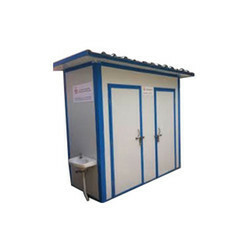 We are an illustrious company engaged in offering a quality assorted range of Prefabricated Toilets that are provided in various specifications as per clients’ variegated requirements. The offered toilets are fabricated using premium quality raw materials and the contemporary techniques. These toilets find application in various industrial sites, hospitals hotels, restaurants and many other places. Moreover, our clients can purchase these toilets at marginal rates from us.